If you lived anywhere on the east coast of NSW in 1974, you might remember the famous storms of that year. They were memorable for the damage they caused – such as the loss of the beach sand everywhere; the damage to the apartment blocks at Collaroy Beach, and damage to Manly wharf and destruction of the famous harbour swimming pool and walkway. In this story from June 1974 the storm-surge was sufficient to stop the tide running out of Pittwater and the Hawkesbury River, while the planks of the Palm Beach Wharf were under water! It was a Sunday afternoon and the three-man crew of police launch Falcon had just returned to its home base Church Point. The boat had been refuelled the radio operator received a call to attend a boat in distress off Tuggerah; it had been seen roll over in the bombora by the local lifesavers, who were unable to reach it in their power boat. Falcon was turned around and set off for Broken Bay, where the crew were astounded by the size of the swell running from SSE. A decision had to be made and all agreed they would never forgive themselves if they didn’t try and someone drowned. So they went. It was many hours later that the exhausted crew with their rescued survivors of the ketch Wotan finally returned to Pittwater around one o’clock in the morning. They had all endured many harrowing hours battling huge seas and gale-force winds – the flashes of the ‘Joey’ lighthouse never looked so good as they did that night! All the crew members of Falcon were subsequently awarded the Queen’s Commendation for Brave Conduct. I am an artist. I draw, and paint pictures – telling a story with imagery rather than words. It’s something I’ve been doing since I could first pick up crayons and pencils, and I often wonder whether the hours I spent poring over the illustrations in children’s adventure books influence my interest in illustrating events of the past for which there are no photographs. Stories are told or recorded, but it is left to the imagination of the listener or reader to paint a picture in their mind’s eye. 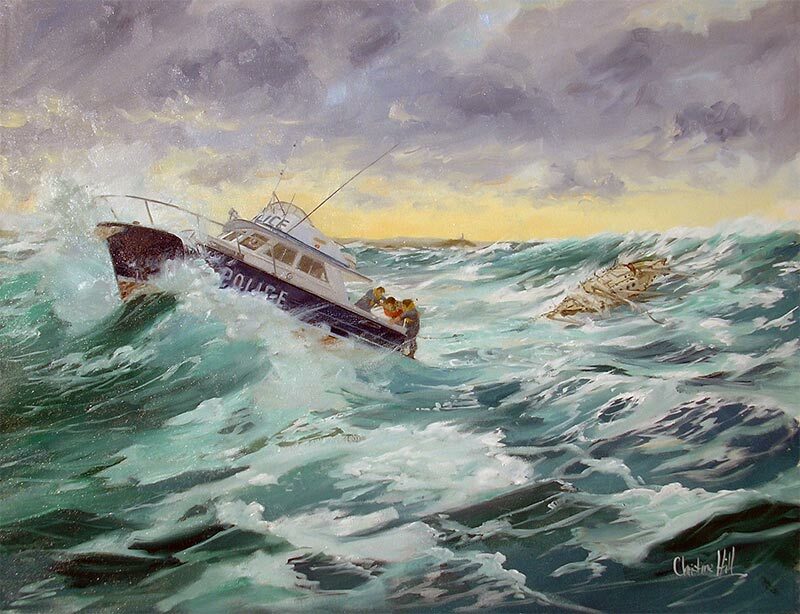 There are many members of the Australian Society of Marine Artists who do just this – we hear a tale which interests us and we research and study, interview, visit locations, sketch and generally piece together as much information about a topic as we can to enable us to compose a painting depicting the crucial elements of a story. 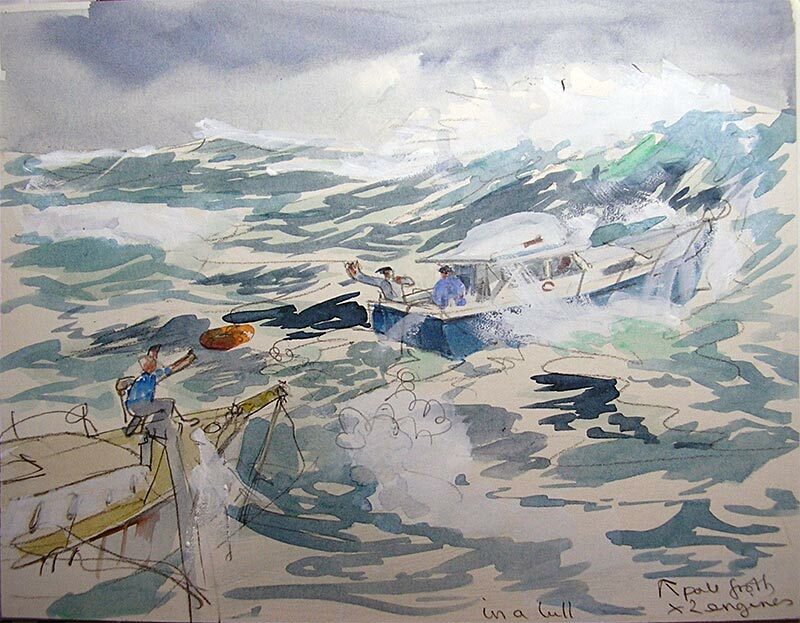 Stories from history books feature largely in marine paintings, but we are also able to record events which although ‘historic’ have actually happened in our own lifetime! And so it was with the story of Falcon and Votan, which came to me through family connections. 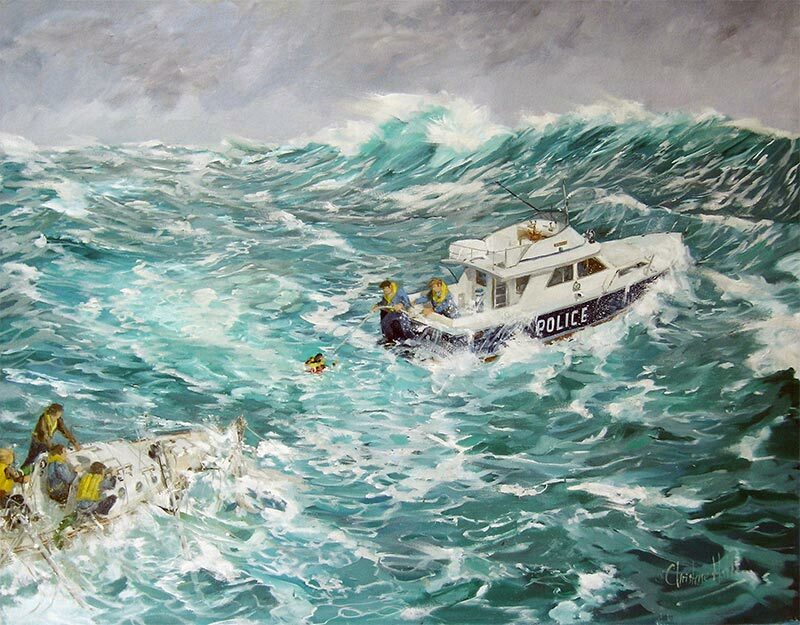 There were three crewmen on the Police launch Falcon – Roper (Buster) Brown, Brian (Friendly) Friend and Gordon (Boot) Wellings – and it was at the sad occasion of Gordon’s funeral in 2010, when the story was told by his mates, that the inspiration came to me to paint this event. I was very fortunate that Jean Wellings and Friendly were able to give me a lot of help with the details of the story and some photographs of the Falcon taken in the 1970s and I spoke at length with both of them. The danger and drama was largely about the huge seas and high winds – there was no rain falling, although everyone was drenched! The sun was low over the western horizon and the sky to the south and east was “black”. The spray was horizontal and the waves were “three times boat length” and capping. The policemen wore faded blue overalls, the survivors from Wotan put on lifejackets after the roll-over (I have one in my shed of that vintage!) and everyone was soaked. There were no life-lines, so Boot held Friendly by his belt when he stood on the stern board to pull the survivors aboard. There was no door in the back of the boat and they all had to be hauled up and over. Buster Brown was at the controls the whole time and could only be depicted as a shadow at the window. As for Wotan, she was half-full of water and wallowing; her colour was indeterminate and I had only one faded photo taken some time before the event, to give any idea of her looks. She appeared to have a canoe stern, and the record states that after she rolled, her masts were broken, with stays and gear trailing. I thought about the waves, the direction of the light, where to position the boats – even whether Norah Head Lighthouse could be included, to ‘set the scene’. 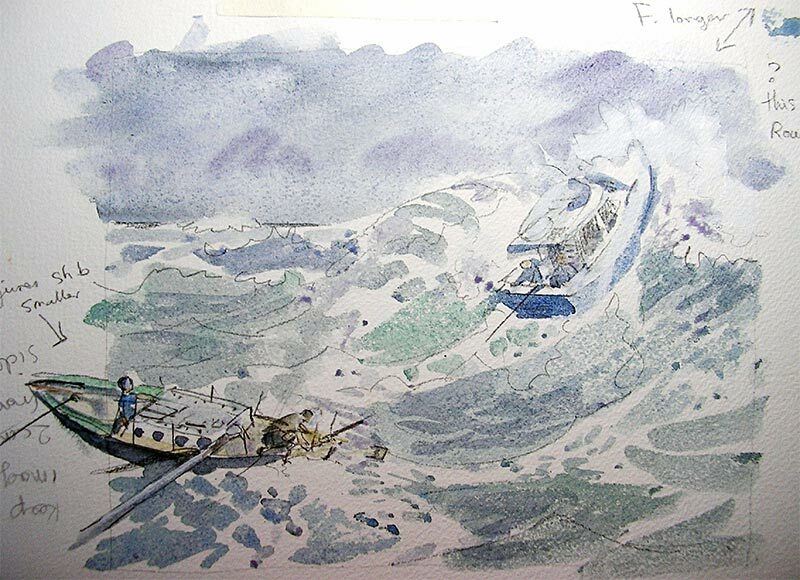 Should I paint the dramatic moment when the tow-line was cut by the giant wave or when the survivors were being pulled across? Look into the sunset, or out at the storm? The difficulty of making an interesting painting of the trip back to Pittwater, after Wotan had to be cast adrift in howling darkness with no moon to illuminate the scene caused that idea to be abandoned. What about the scene inside Falcon? – Buster at the helm, fighting to keep the heading and easing the malfunctioning starboard engine over every wave? Boot at the radio/navigation table? Friendly attending to the rescued and injured lying in blankets on the floor? Lots of decisions had to be made. Imagine Falcon coming across and turning to go just close enough alongside Wotan, churning aqua water and foam. Imagine the last man being brought aboard, just as the sun set, leaving Wotan attached to the tow again. It took about a week of thinking and painting to finish each picture. Then a few more weeks of looking at them – fetching the palette out of the freezer, thawing the paint and making a little alteration here and there – setting up the tripod and easel in the correct outdoors light to make a photograph of each one. That’s the finish! The whole rescue journey demanded exemplary courage of Falcon’s crew, with a high degree of skill and seamanship, and they were all honoured with bravery awards. Buster, Boot and Friendly all received the Thiess Toyota Bravery Award, and the Police Commissioner’s Commendation for Courage at a passing-out parade later that year. Mrs Wedgwood (of English fine china) whose son had been lost from the yacht, flew out from England and presented each of the crew with a piece of unique china that is still a reminder of that fateful day. Then, in September the following year, in a ceremony at Government House, the Governor General Sir Roden Cutler presented each with a medal – the Queen’s Commendation for Brave Conduct.